Welcome to the first blast from the past. I’ll be posting some of my old adventures here in the media section at random intervals moving forward. This one is fun as back in 2012, my friend and partner at Mad Flower Creative, James DiFiore, created a commercial for online dating site I-Hookup.com. They ended up being massive frauds and total scumbags. But we got paid haha and before they were exposed we won the 2012 i-Date Award for best marketing campaign. 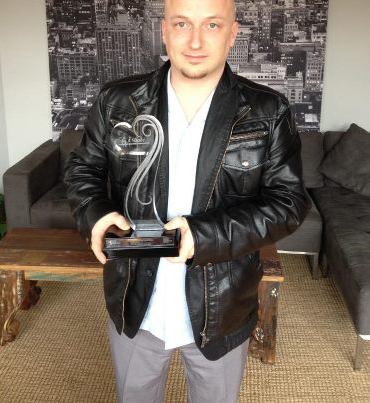 Below is a picture of James with said sham award. Pretty sure he still has it. The original posting of the commercial got almost 400,000 hits on YouTube before being reloaded. Not bad…. for a muffin!!! This project ended up being a fun surprise and my best work so far.. even though it required little from me voice wise, i ended up becoming a major part of this production team. A few commercials were pitched to the client here and of those picked, the first was mostly voice work over images. So… Jay gets hired for a sweet voice gig. Yaaaay, all is happy in the world. Then at the last minute the client picks a different commercial to be the first produced. with no voice work. But… being as the director was in New Jersey at the time, he asked me to take the helm of… well, pretty much everything. Since the clients wishes are LAW…i began creating a casting call and hitting the ground to find appropriate locations for both casting and filming, renting those locations, finding make-up and on-set crew, all within 4 days. Although the casting company did awesome, one of my personal non-union invites was chosen as a final cast member, which made it all seem that much more made to be. So… all went well and one handy dandy Producer credit later, turned out there was some voice work to be done after all. We were all lucky to be working with great professional actors and crew members. Las Vegas: The largest trade show and exposition discussing mobile, investment, strategy and management for the matchmaking, social networking, online… personals, and matchmaking industries. While filming a new commercial out back COWBELL restaurant in parkdale, i encountered a group of what seemed to be vagrants looking for bottles or anything of value. It was the thoroughness of the search that caught my eye. It turns out they were cleaning up needles. Although i got no footage of the meeting, they spoke of the value the Toronto Outreach program has given their lives. Heading to the Toronto.ca website I found very little on the outreach program itself, but found that the city does offer a wide range of programs for people to get involved with on every level. With the constant TTC troubles and the current ousting of Mayor Rob Ford, it’s nice to see that certain parts of the system still work. 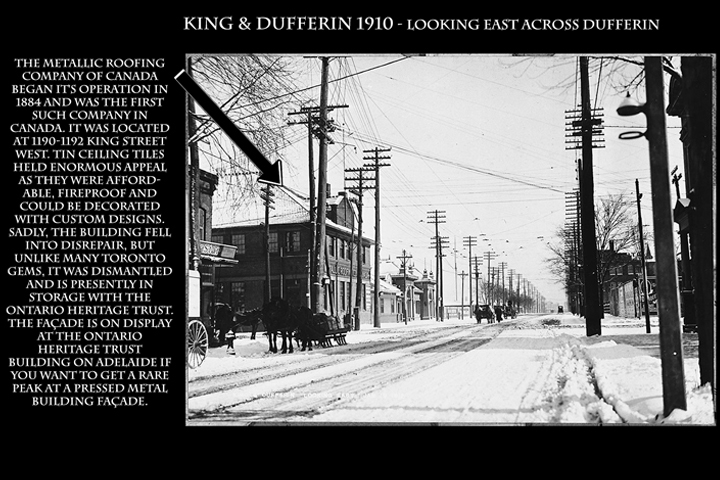 Episode 1: The Metallic Roofing Company of Canada at the corner of King & Dufferin. This is my first attempt at video blogging. These blogs will include the all the band interviews, show reviews, nutritional info and local outrages i used to rant about on my old radio show “Parts Per Million”, but now we will include Food, Fun, Local History, Old School Installation Art, Fitness Info and Videos, Random Adventures and of course… Cat Pictures. The series of Installation Art that I’m doing will go by the name “A Hundred Years Later” due to the tagline i seem to keep using.